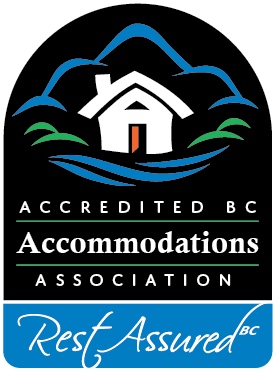 Many of the members of Accredited BC Accommodations are ready and willing to deal with the “Travel Trade”. This includes the following criteria: they have a proven track record, they have the required liability insurance, they are able to accept reservations year round, they are able to respond to inquiries within 24hours, and they are willing to offer a commission or net rate. ThistleDown House has been working closely and successful with the travel trade for fifteen years. 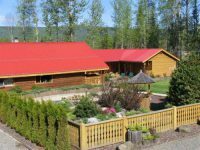 Ruth and Rex were recognised by BC Innkeepers with the prestigious Moyra Turner Hosdpitality Award in 2004, by the community with an award for Business Excellence in 2009, and by Trip Advisor as the 9th most popular Bed & Breakfast inn in Canada in 2010. Call us; we will work with you to best serve your clients. Crystal's view providing commissionable rates and operating year round. Please contact us for any further info, we would like to work with you and promises to be a highlight for your clients travel. The Blue Grouse Country Inn has been working with the travel trade since it opened in 2002. Our rates are commissionable and we reply to any requests within a 24-hour time frame in english or german. We operate during the summer season only but provide email contact year-round. We are happy to arrange inclusive packages in cooperation with BC Backcountry Adventures Ltd., guiding in Wells Gray Park for more than 27 years. We are a Canada Select approved property with 4 1/2 Stars. Abbeymoore Manor in Victoria has a long established & successful history of working with the travel trade. If you are looking to include an amazing stop on your client's itinerary give us a call to find out how we can work together. Abbeymoore has been rated Canada's # 1 B&B on TripAdvisor for the past 6 years and Anne & Ian were awarded the BC Innkeepers Guild's highest honor, the Moyra Turner Award in 2007!